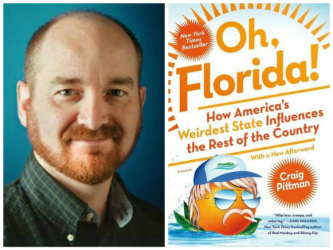 Please join on Monday, February 11 at 3 pm (note special time) to hear award-winning Florida journalist and author Craig Pittman talk about his book Oh, Florida! : How America's Weirdest State Influences the Rest of the Country. The book is published by Picador/St. Martin's Press. After his talk, Craig will be happy to sign copies of his books. CRAIG PITTMAN is an award-winning reporter and columnist for Florida's largest newspaper, the Tampa Bay Times. He is a native Floridian who has written three previous books about Florida topics: Paving Paradise: Florida's Vanishing Wetlands and the Failure of No Net Loss ( Florida History and Culture (2009), Manatee Insanity: Inside the War Over Florida's Most Famous Endangered Species (2010), The Scent of Scandal: Greed, Betrayal, and the World's Most Beautiful Orchid (2012). He lives in St. Petersburg with his wife and two children.